Secretary of State for Communities and Local Government, the Rt Hon Eric Pickles MP, visited North Somerset Council offices at Castlewood, Clevedon as part of a whistle-stop tour of the region. He was greeted by Councillor Nigel Ashton, Leader of the Council and members of the Executive. Councillor Ashton said he was pleased Mr. Pickles has been able to schedule the visit into his busy diary. North Somerset Council’s innovative programme to reduce its office estate moves ahead with the re-opening of the newly refurbished Town Hall in Weston-super-Mare. 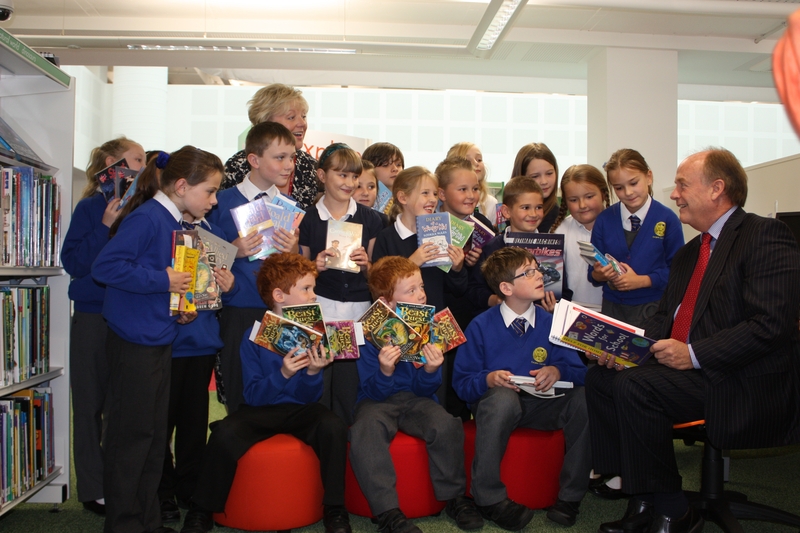 Councillor Nigel Ashton and Councillor Felicity Baker enjoy a story with local school children at the opening of the new Libary and Gateway at North Somerset Council offices in Weston-super-Mare. From Monday October 1, the refurbished Town Hall building will be open seven days a week bringing North Somerset Council’s customer-facing services and a new central library together for the first time all under one roof. 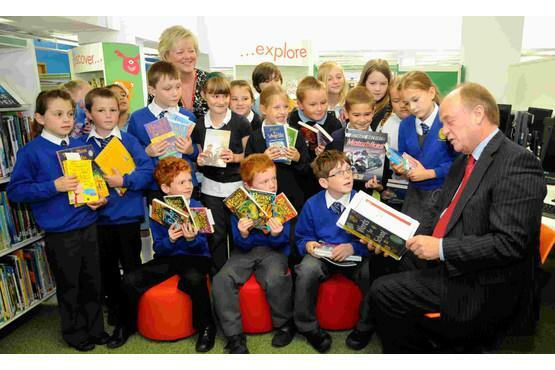 Councillor Nigel Ashton, Leader of North Somerset Council said “This wise investment in the Town Hall means we can offer more services to local people in one place, provide a new library fit for the 21st century and support the regeneration of Weston town cnetre. However, the Town Hall is one part of a much bigger story. At a time when we are facing severe budget challenges, the transformation of our office estate will not only help us improve the way we work and provide better services, it will also deliver annual savings of £700,000 by 2015. Focusing our activities on two main buildings helps uf to avoid duplication, save money, save energy, avoid silo working and provide a much better experience for local people”. Comments Off on North Somerset Council’s innovative programme to reduce its office estate moves ahead with the re-opening of the newly refurbished Town Hall in Weston-super-Mare. WE STARTED THE PROCESS FOR THIS BUDGET BEFORE YOU TODAY, ALMOST TWO YEARS AGO, WHEN WE WERE FIRST GIVEN THE TASK OF FINDING £47MILLION IN SAVINGS OVER FOUR YEARS. I BELIEVE THAT WE HAVE MADE A GOOD START AND ARE AHEAD OF MANY OF OUR COLLEAGUES IN OTHER AUTHORITIES IN THE WAY WE HAVE PLANNED AND BEEN OPEN WITH THE PUBLIC, OVER WHAT WE HAVE BEEN CONSIDERING. I WAS PLEASED WITH THE PUBLIC RESPONSE EVEN THOUGH I ALSO REALISE THAT YOU CAN NEVER GET IT RIGHT FOR EVERYONE. LETTERS SAYING WHY DON’T WE EVER ASK THE PUBLIC FOR SUGGESTIONS , LED TO LETTERS SAYING IT IS OUTRAGEOUS THAT WE ARE HAVING TO ASK THE PUBLIC. THE CURRENT YEAR SAW £18.6 MILLION OF SAVINGS REQUIRED AND I AM DELIGHTED AND PROUD TO SAY THAT WE ARE ON COURSE TO COME IN ON BUDGET THIS YEAR. YES I DID SAY PROUD … PROUD OF OUR MANAGEMENT TEAM AND STAFF WHO HAVE MAINTAINED THEIR HIGH STANDARDS DESPITE THE DIFFICULTIES OF CONTINUED DEMAND AND AN UNCERTAIN FUTURE., AND PROUD THAT THIS ADMINISTRATION HAD THE INTEGRITY TO START DEALING WITH THE PROBLEM BEFORE THE LAST ELECTION AND CONTINUES TO DO SO. THE MAJOR ISSUES WE FACE ARE NOT OF OUR CHOOSING NONE OF US ARE HERE TO PRESIDE OVER ANY REDUCTION IN VITAL SERVICES BUT NEITHER ARE WE HERE TO MOAN ABOUT HOW UNFAIR IT ALL IS. WE ARE HERE TO HELP GET THE RESIDENTS OF NORTH SOMERSET THROUGH THE TRANSITION TO SMALLER GOVERNMENT, TO AN ERA OF LESS “WHY DON’T THEY DO IT”, TO “WHY DON’T WE DO IT”. LOCAL GOVERNMENT IS CHANGING, EVEN WHEN THIS FINANCIAL CRISIS HAS BEEN OVERCOME, LOCAL GOVERNMENT WILL NEVER GET ANY SIGNIFICANT INCREASE IN FUNDING BUT WILL BE EXPECTED TO WORK INCREASINGLY WITH OTHER COUNCILS, BEING FUNDED JOINTLY WITH OTHER ORGANISATIONS WITHIN THE AREA, SUCH AS THE NORTH SOMERSET PARTNERSHIP AND WITH CENTRAL GOVERNMENT DEALING MORE WITH SPECIFIC REGIONAL BODIES SUCH AS THE LEP. 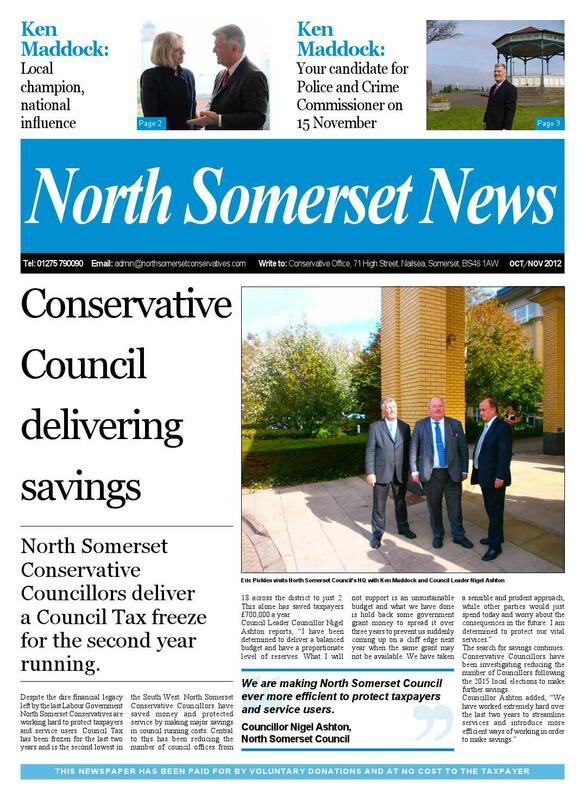 CHALLENGES ARE NOT NEW TO NORTH SOMERSET, WE HAVE A REPUTATION FOR FINANCIAL CONTROL AND BEING AN EFFICIENT, LOW FUNDED, LOW SPENDING, HIGH PERFORMING AUTHORITY. OUR APPROACH WILL CONTINUE TO BE TO REDESIGN SERVICE PROVISION RATHER THAN JUST CUTTING THEM , THAT IS WHY WE HAVE NOT HAD TO ANNOUNCE WHOLESALE REDUNDANCIES LIKE SOME COUNCILS. HOWEVER THESE ARE UNPRECEDENTED TIMES AND FURTHER CUTS WILL COME. WE WILL CONTINUE TO DO OUR BEST TO AVOID REDUNDANCIES. BUT IT IS NOT JUST ABOUT CUTBACKS, IT IS ABOUT INVESTMENT. WE RECOGNISE THE NEED FOR THE COUNCIL TO CONTINUE TO PLAN SENSIBLY AND PRUDENTLY OVER THE MEDIUM TERM FOR THE SERIOUS FINANCIAL CHALLENGES WE, ALONG WITH THE WHOLE OF THE PUBLIC SECTOR, WILL FACE. IT IS OUR VIEW THAT BUDGET PLANNING MUST BE MULTI-YEAR IN ITS APPROACH, AS OPPOSED TO ONE YEAR AT A TIME. IT IS ONLY IN THIS WAY THAT THE COUNCIL WILL BALANCE ITS LONG TERM GOALS AND PRIORITIES TO EASE THE TRANSITION OF SERVICES. WE WILL BUILD ON THE SUCCESS OF OUR OFFICE AMALGAMATION PROGRAMME, WHICH IS SEEING US REDUCE FROM 18 OFFICE BUILDINGS TO 2, HALVING OUR FLOORSPACE AND SAVING £700,000 PER YEAR. THE LATEST INVESTMENT IN THE TOWN HALL WILL SIGNIFICANTLY INCREASE THE NUMBER OF STAFF BASED HERE AND OUR PARTNERSHIP WITH AGILISYS IS ALREADY BRINGING 80 NEW PRIVATE SECTOR JOBS. AS YOU KNOW CHAIRMAN WE HAVE BEEN SHORTLISTED FOR A NATIONAL AWARD FOR THIS “””INVEST TO SAVE””” INITIATIVE. IT IS MISCHIEVOUS THAT SOME STILL SEEK TO QUESTION THE BENEFITS, BOTH FINANCIAL AND WORKING PRACTICES, OF THIS INVESTMENT. ADMITTEDLY OUR TASK IS MADE HARDER, HOWEVER, BY THE CONTINUED INEQUITY OF GOVERNMENT FUNDING – WHICH THE COALITION HAS YET TO ADDRESS. OUR GENERAL GRANT HAS BEEN REDUCED BY 7.65%, AND AGAIN, WE HAVE BEEN HIT BY DAMPING. THE COUNCIL WILL LOSE JUST UNDER £4M OF WHAT EVEN THE GOVERNMENT AGREES WE SHOULD BE RECEIVING , ALONG WITH POOLE WE ARE THE ONLY UNITARIES IN THE COUNTRY THAT LOSE OVER 7% OF OUR GRANT VIA THIS ARRANGEMENT. TAKING INTO ACCOUNT ALL COUNCILS, POLICE AND FIREBRIGADE, £54M OF GOVERNMENT SUPPORT THAT SHOULD COME TO THE AVON AND SOMERSET AREA IN 2012/13 WILL TRANSFER TO OTHER PARTS OF THE COUNTRY. WE WILL CONTINUE TO TRY AND GET THIS CHANGED. THAT IS WHY WE ARE UNABLE TO AGREE THE LATEST OPPOSITION AMENDMENTS, WHICH ARE NO MORE THAN TINKERING FOR HEADLINES………., ACCEPTING THE DIFFICULT CHOICES WE HAVE HAD TO FACE AND THEN JUST ADDING A LITTLE BIT BACK . THE OPPOSITION PRESENT A BUDGET WHICH WILL INCREASE THE FUNDING GAP FOR THE FOLLOWING TWO YEARS BY £2M TO £8.1M. WE NOW KNOW THAT THIS GAP WILL GROW FURTHER AS A RESULT OF THE CHANCELLOR’S AUTUMN STATEMENT, AND THAT FURTHER REDUCTIONS WILL BE REQUIRED IN 2015/16 AND 2016/17. TO INCREASE SPENDING AND REDUCE CONTINGENCY AT A TIME OF EVEN MORE REDUCTIONS IN FUNDING WOULD BE IRRESPONSIBLE TO OUR RESIDENTS AND OUR STAFF. IT IS FOR THAT REASON, THAT THE PROPOSALS PRESENTED IN FRONT OF US CANNOT BE SUPPORTED, AT THE MOMENT. BUT AS I SAID AT THE EXECUTIVE MEETING, WE WILL ALL BE MONITORING PERFORMANCE BOTH FOR THE REST OF THIS YEAR AND THROUGHOUT NEXT YEAR AND IF ANY FUNDING BECOMES AVAILABLE WE WILL CONSIDER ALL THE PROPOSALS AS SHOWN. AFTERALL THEY ARE JUST INCREASES ON WHAT WE ARE ALREADY DOING AND WHAT WE WOULD ALL LIKE TO PUT MORE RESOURCES INTO. WITH REGARD TO THE COUNCIL TAX FREEZE GRANT, IT IS RIGHT TO ACCEPT THE GRANT GIVEN THE FINANCIAL PRESSURES THAT A SIGNIFICANT NUMBER OF OUR COMMUNITY FACE. I FIND THE NOTION OF REJECTING GOVERNMENT SUPPORT, AND ASKING RESIDENTS IN THESE DIFFICULT TIMES TO PICK UP THE BILL, BIZARRE. I UNDERSTAND THE DIFFICULTIES THAT THIS MAY CAUSE SOME AUTHORITIES NEXT YEAR, BUT THAT IS WHY WE HAVE CHOSEN TO SMOOTH THE EFFECT OF THIS GRANT OVER AT LEAST THE NEXT TWO YEARS. THAT IS NOT A SIGNAL TO GOVERNMENT THAT WE DON’T NEED THE MONEY BUT RATHER MORE, SENSIBLE AND PRUDENT FINANCIAL PLANNING – WHICH OUR STAFF HAVE BEEN RECOGNISED FOR. I HAVE ALSO NOTED SOME DISINGENUOUS COMMENTS REPORTED IN THE PRESS ABOUT THE EXECUTIVE ‘SQUIRRELING AWAY’ FUNDS THAT COULD BE USED TO SUPPORT KEY SERVICES. MEMBERS ARE REMINDED THAT IN THE CURRENT YEAR WITHOUT THE CONTINGENCY AND TRANSITION BUDGETS, WE WOULD BE FACING A £3M OVERSPEND AND SOME OF OUR SERVICES WOULD BE FACING EVEN GREATER REDUCTIONS OVER THE NEXT THREE YEARS. OTHERS MAY WISH TO TAKE THAT RISK, BUT I BELIEVE SUCH ACTION WOULD DEMONSTRATE FINANCIAL NAIVETY. IN TERMS OF PUBLIC CONSULTATION, THIS BUDGET RESPONDS TO THE MAJOR ITEMS RAISED. OUR PROPOSALS DO NOT INCLUDE IMPLEMENTING CHARGING FOR GREEN WASTE COLLECTIONS, THERE ARE REDUCTIONS IN THE COST OF MEMBERS ALLOWANCES I.E.NOT ALLOWING COUNCILLORS TO STAY IN THE PENSION FUND , AS PROPOSED BY AN INDEPENDENT PANEL AND ORIGINALLY SUGGESTED BY THE OPPOSITION, WE WILL HAVE A COMPREHENSIVE REVIEW OF THE WHOLE ISSUE OF CAR PARKING CHARGES AND THE BUDGET CONTAINS MANY EXAMPLES OF MOVES TO MODERN AND EFFICIENT WORKING, INCLUDING SIGNIFICANT SAVINGS FROM THE OFFICE AMALGAMATION PROGRAMME. THE CHIEF EXECUTIVE AND HIS DIRECTORS HAVE ALREADY TAKEN ACTION TO RESTRUCTURE COUNCIL DEPARTMENTS IN LINE WITH CHANGING WORK PATTERNS AND FURTHER CHANGES WILL BE MADE. I HAVE ALSO ASKED HIM TO LOOK AT OPTIONS FOR REORGANISING COUNCILLOR ROLES SO THAT MORE COUNCILLORS CAN PLAY AN ACTIVE PART, AT THE SAME TIME WE WILL BE LOOKING AT OPTIONS TO REDUCE THE NUMBER OF COUNCILLORS, IN LINE WITH PUBLIC OPINION, NATIONAL TRENDS AND CHANGING WORKING PRACTICES . KEY TOPICS RAISED BY SCRUTINY PANELS HAVE BEEN FULLY DEBATED AND BEEN SUBJECT TO FURTHER PRESENTATIONS AT COUNCIL. TO DESCRIBE THIS LEVEL OF CONSULTATION AS A SHAM SEEMS CHURLISH. FINALLY, MANAGING THE CHANGE SUCCESSFULLY WILL REQUIRE THE CONTINUED ACTIVE SUPPORT OF COUNCILLORS AND STAFF AND, MOST IMPORTANTLY, LOCAL RESIDENTS AND COMMUNITIES. 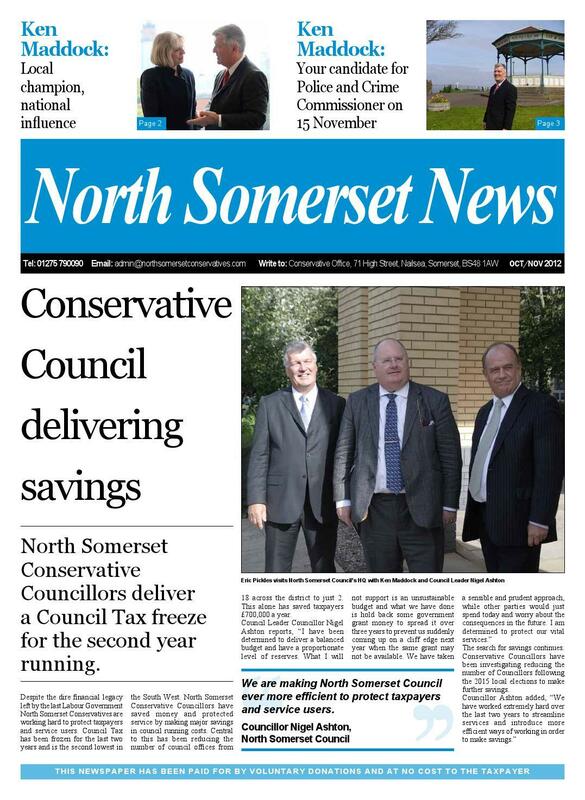 NORTH SOMERSET COUNCIL WILL LOOK, FEEL AND OPERATE VERY DIFFERENTLY IN THE FUTURE. WE WILL NOT BE ABLE TO MAINTAIN ALL SERVICES AT THEIR CURRENT LEVELS, BUT WE WILL STRIVE, WITH YOUR HELP, TO MINIMISE THE ADVERSE IMPACT ON OUR AREA AND COMMUNITIES. These are the main contents of my diary for the last month. 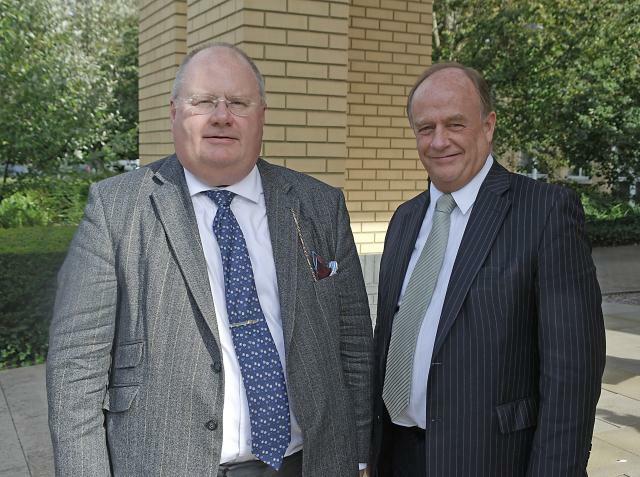 24 May – “Fireside Chat” with Eric Pickles MP with other Conservative Leaders in Westminster. He confirmed that the issue of Council Tax damping will be recognised in the new financial regulations coming up. 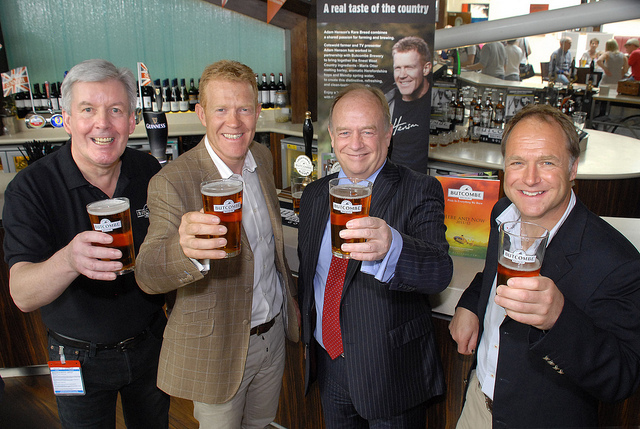 He was very positive about the West of England LEP and supportive of investment coming through. He was still adamant that local government has to improve purchasing power by working together. He indicated that there will be changes to planning laws and local government increase in planning fees. He mentioned an intention to get rid of local government newspapers and was hopeful of announcing more revenue incentive schemes for local government. 30 May – West of England LEP meeting on the Bristol Region City Deal and meeting with the new Leader of Bristol to discuss the election of a Police Commissioner and Mayor. 31 May – Chaired the Integrated Care Transition Board with representatives from the local authority, NHS, PCT and Community Services. Very early days and nothing has been agreed yet. 1 June – Briefing on the Armed Forces Covenant followed by a briefing on Integrated Care. Saturday 2June – Attended the Bath and West Show followed by local Jubilee events during the weekend. 7 June – Met with officials from National Grid. 11 June – Chaired the Police and Crime Panel meeting. Attended the Integrated Care Finance Meeting at WestonHospital. Chaired the Armed Forces Covenant wider key members meeting at the Town Hall. 14 June – Attended the West of England LEP Board meeting. In the evening attended the Excellence in Business Training awards. 15 June – Met with Greg Clarke MP and Bob Neil MP at the LGA Conservative Group Leaders meeting in Pimlico. Ongoing discussion about devolving further powers to local government but concerns raised that regional funding was not available and legislation did not always seem to be as helpful as initial promises. Saturday 16 June – Attended the party candidate selection meeting for Police Commissioner. 18 June – Attended CMT/Executive. 19 June – Attended the Westminster Briefing with representatives of the West of England LEP and Dawn Primarolo MP, Don Foster MP, Charlotte Leslie MP, Chris Skidmore MP, Jack Lopresti MP and Steven Williams MP, all of whom have agreed to lobby government in support of the City Deal proposals to increase funding to the 4 West of England authorities which is fundamental to the success of plans for capital expenditure and growth. 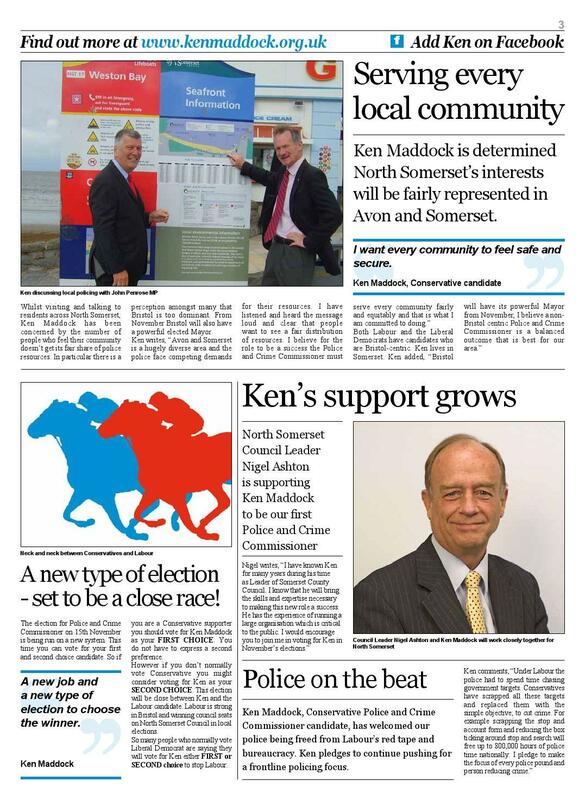 20 June – Attended the Avon and Somerset Police Authority Annual Meeting. 21 June – Attended an Integrated Care Finance Meeting. 22 June – Meeting with the Rt Hon Justine Greening MP, Secretary of State for Transport at BristolAirport. Meeting with Carl Haley, Director of Persimmon Developments. Meeting with Sir Merrick Cockell, Chair of the LGA. I also received regular briefings from offices of all departments. If you would like further details of any of these issues, please do not hesitate to contact my office. The year 2011 seemed to be particularly difficult, with the start of all the funding cutbacks, the seemingly endless problems for the Euro particularly in Greece and Italy, the riots in major cities across the country and of course the continuing wars in Afghanistan and Iraq, as well as the dreadful situation in Libya and in many African states. Realising that many communities around the world face dreadful suffering and hardship does not solve our own problems but it does bring them into perspective. I am sure that 2012 is going to be a positive year and I am delighted that it has already started with good news. Besides the £95million we have been awarded to improve the rapid transport from Long Ashton park and ride, to the centre of Bristol and the building of a new link road from the A370 to the A38 in the North, we now know that we have also succeeded in getting another £15million to improve transport into and out of Weston super Mare. We will have the improvements to Junction 19 nearing completion and improvements to Junction 21 about to start. The new offices in Clevedon will be almost full to capacity with a lot of space rented to our working partners who have also recruited over a hundred extra staff locally, and the Council’s head office in Weston will have been renovated so that we can move around 900 staff into the centre of town and provide a wonderful new library. Yet again our partners, Agilisys, have just announced that they have won a new contract which they are transferring to our head office and will shortly be recruiting up to 80 more staff. Work has started on employment opportunities and housing in Locking Parklands and there will be new hotels in Weston and a new hotel in Portishead. The £35million private development of Dolphin Square is progressing well and the Transport Minister has expressed his interest in Portishead rail, so we will continue to argue the case for funding. All these projects not only increase investment in North Somerset but provide local jobs and make us an even more attractive location for businesses to trade. Finally, we have decided to knock down the old Tropicana building which was an eyesore. Despite what some will say, we do still welcome viable proposals for the site. Whatever is eventually built there, would entail getting rid of the existing old structure, so we may as well do that now and make the seafront more attractive. There will always be some who only like to criticise but I think we can look forward to the new year with enthusiasm. Financial resources of course. We started with a 31% reduction of net budget over four years, now we are told that this has been extended to year 5 and 6 when there will be a 6% reduction in each year. But a 43% cut in funding is even worse than it sounds because at the same time, we have inflation in prices of contracts and growth in demand for care services. People’s savings are reducing as there is very little interest earned, allowing more of our ageing population to qualify for help Care services already take 41% of our net budget. We are just starting year two and have a balanced budget again, but subsequent years will be far more difficult, we are already low funded, that has been acknowledged and even a well run Council will run out of efficiencies and savings to make. The biggest task will be to demonstrate to our residents that we are still providing far better services than any of our neighbouring Councils but some reductions are inevitable. We are in constant talks with Ministers as well as working with other Councils where that provides efficiencies, and with local and regional businesses. Investment in North Somerset with construction and jobs, is still good. Integration of Health and Social care will take most of this year to establish. It is an obvious and important change to make from the patients point of view, as long as we get the structure correct, with more of the decisions being left with the service professionals and not Administrators or Politicians. The Council will assume a wide ranging strategic, funding and scrutiny role but with less day to day management . With one person having control over vital services for such a large area, this appointment is bound to affect North Somerset Policing. Whether the election is won by a Party Politician or not, Bristol will have a huge advantage in the selection process as the voting takes place at the same time as their vote for Mayor. A Bristol based Commissioner could concentrate resources within the City and if that happens it will be important that the Police and Crime Panel uses it’s only real authority, to veto the Budget. All the local councils, with myself as Chairman are working on the future make up of the Panel with this in mind. I know it was supported by the Prime Minister but I did not agree it was good for Bristol and certainly not for North Somerset residents.